‘Comedians in Cars’ recap: Who knew Obama was so funny? Is it possible to be the leader of the free world and still have a sense of humor? For President Barack Obama, the answer to that question is a definite yes. The Commander in Chief opened up the new season of Jerry Seinfeld’s Comedians in Cars Getting Coffee with one of the best episodes in the show’s history. The episode hit on politics at times, but it was more tangential and for humor value. It turns out the President can talk about other topics and be funny doing it. Seinfeld almost always chooses a car fitting of his guest. When his guest is someone as big as the President, he had a tough decision on his hands, so naturally, it had to be a Corvette. Jerry chose a blue 1963 Corvette Sting Ray with a split rear window because, let’s face it, it’s a really cool car. The scene where the two meet is hilarious, starting with Jerry leaving the car and walking up to the window in his jeans and bright white tennis shoes. The President is wearing a jacket and tie and the host wears nurse’s shoes? More power to him, I guess. Next, Seinfeld knocks on the window and the President just points to the door. 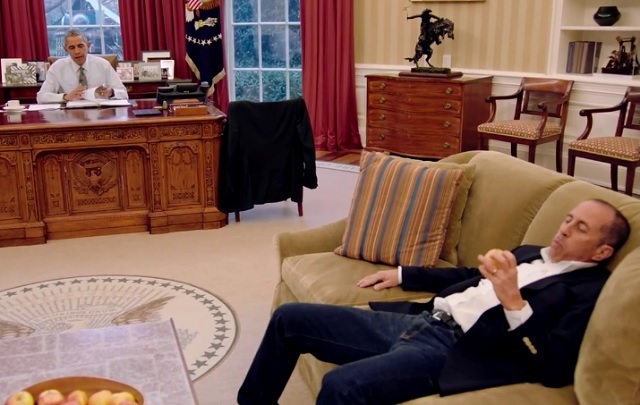 Once he gets inside, Jerry takes a seat on the couch and bites into an apple while waiting for Obama to finish some paperwork. Then, the host is ridiculed for leaving his apple on the table before being told to throw it away in the “non-Presidential garbage.” Needless to say, the episode was off to a hot start. Unfortunately, Seinfeld and Obama could not leave the White House grounds. “You’re a comedian with the president going nowhere,” a security guard told the duo as they tried to exit at the gate, “Back it up.” Obama then made a joke about how young children like him for his oversized ears and his fun to say name. For two people who are more than likely acquaintances, Obama and Seinfeld played off each other very well. Are we sure that they don’t hang out on a regular basis? I can imagine Barry and Jerry having a cookout together in someone’s backyard. It was like the episode had been scripted for funny moments, but it was clear the two were just playing off each other. En route to getting their coffee, the duo walked through these beautiful rooms and hallways of the White House. The episode was taped on Dec. 7, so there were Christmas trees and decorations lining the doorframes and walls of various rooms. But the short turnaround did not prove problematic. The quality of the episode was on par with the rest of the series. The coffee portion of the episode took place in arguably the ugliest coffee venue in series history: the White House staff break room. With red-and-white checkerboard table cloths, it looked like a typical break room from an older office building. That might have been the biggest surprise of the episode, even more so than Obama’s impressive comedic timing and sense of humor. I would have thought the White House had a modern, updated break room for its staff. Guess not. Then came Jerry’s No. 1 fallback topic… underwear. I wrote about this problem last season because it has been a prominent recurring joke on Seinfeld’s shows. The first portion of it, I’ll let slide because it felt like a follow-up to Obama’s earlier comment on a lack of anonymity. But coupled with his question about the President’s underwear preference (“one brand or a number of brands?”), I had to roll my eyes. If there is another underwear joke this season, I might just lose it. In my opinion, the funniest line of the episode was Obama’s response to a simple question from Seinfeld. The host asked: “What’s your most embarrassing president moment?” to which the President responded, “This may be it.” There is even audible laughter from the crew in the background. As the conversation continues, Obama segues to a recent round of golf with Seinfeld creator Larry David. Apparently, David singlehandedly keeps Banana Boat in business because he cakes on the sunscreen. The best part is that Jerry knows what is coming and they are still able to make it funny for the viewers. The coffee conversation also included a question about the sanity of other world leaders, which included a line from Seinfeld saying “privilege is toxic,” something very relevant given some recent news. Before returning to the car, the president made sure to get in an Obamacare plug while also making fun of his frequency with Obamacare plugs.